These turkey burgers are so good that you might give up traditional beef hamburgers altogether. The thick grilled patties are topped with prepared cranberry sauce and served on toasted English muffins for a nice change of pace. In a large bowl, combine the first six ingredients. Crumble turkey over mixture and mix well. Shape into six patties. Using long-handled tongs, moisten a paper towel with cooking oil and lightly coat the grill rack. Grill patties, covered, over medium heat or broil 4 in. from the heat for 10 minutes on each side or until browned. Spread mayonnaise over muffin halves. 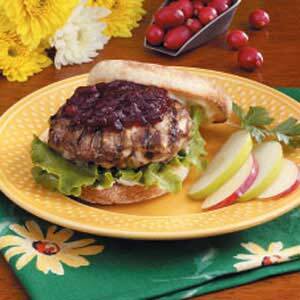 Place the lettuce, turkey burgers and cranberry sauce on muffin bottoms; replace tops. Yield: 6 servings.